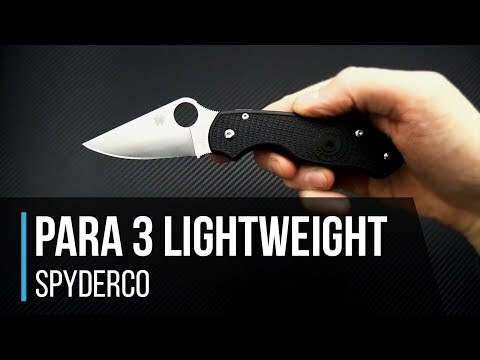 The Para 3 was designed by Spyderco to meet a demand for a smaller version of the cornerstone Para Military 2 and is now being offered in a svelte, budget friendly, Lightweight FRN Version! The same excellent Compression Lock design gets contoured Bi-Directional FRN scales, a deep carry wire pocket clip and satin finished blade of BD1N. The Para 3 Lightweight is sure to be a favorite among users and collectors alike. 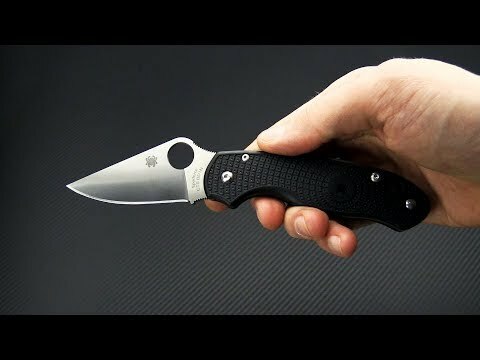 Brand new directly from Spyderco Knives, Inc.
Blade: The fully flat ground, satin finished CTS-BD1N blade has an iconic Clip Point profile with plain edge for general slicing needs. The blade opens with the trademark SpyderHole opener and jimping at the thumb and choil provide superb control. At 3.7mm thick the blade is robust enough for serious work while still offering excellent slicing performance thanks to the flat grind and taper to the point. Handle: Contoured, injection molded FRN handle scales sit over inset stainless liners, one forming the Compression Lock mechanism. The use of Fiberglass-Reinforced Nylon (FRN) decreases the weight by nearly 30 percent while still maintaining a high level of durability and resistance to the elements. A slight belly and finger choil offer comfortable ergonomics allowing for a great grip for most sized hands with the Bi-Directional texturing delivers optimal traction even in the most adverse conditions. Torx screw handle construction allows for easy adjustment and the open back construction makes cleaning and maintenance a breeze. A generous hole is provided for lanyard attachment. Carries via a reversible (tip-up) stainless steel wire deep carry clip. CTS-BD1N: BD1N is a high Carbon, high Chromium, Nitrogen martensitic stainless steel from Carpenter. Designed as an improvement or evolution of CTS-BD1, BD1N has higher working hardness, up to 63HRC, while retaining good toughness and edge stability. BD1N also has higher amounts of Chromium, Manganese and Silicon in its composition for enhanced performance. CTS-BD1N works well as a knife steel with a fine grain, high corrosion resistance and respectable edge holding ability. At max hardness CTS-BD1N can operate with a 12°-15° per side edge.